After the recent announcement of the new BitMain BM1385 ASIC chips for mining Bitcoin or other SHA-256 crypto currencies BitMain has started taking pre-orders for their first miner based on the new chips – the Antminer S7. The new BitMain Antminer S7 miner has a more dense configuration than previous Antminer machines, using 162 chips in the same space that the S5 used only 60 in. 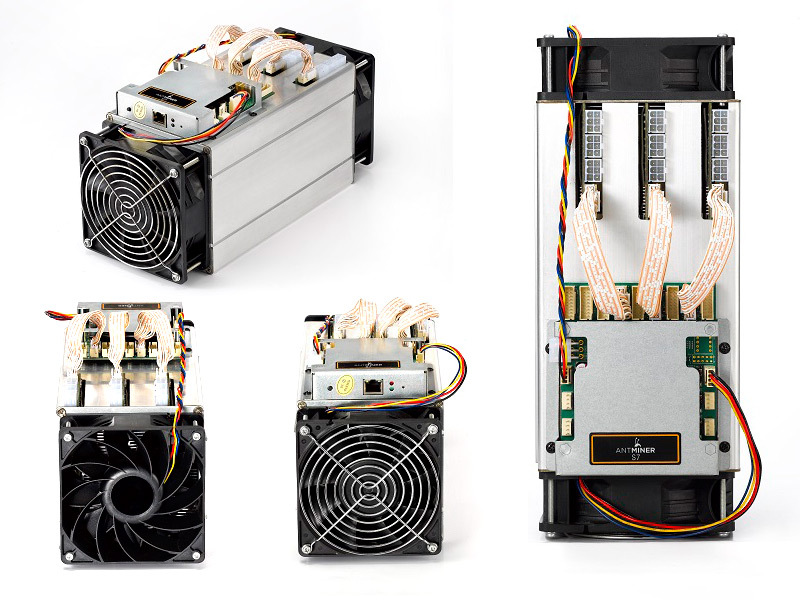 The S7 uses just 1210 watts of electricity to deliver 4.86 terahashes per second of mining power per unit, so specification wise the new miners looks very attractive, especially when compared to older hardware. You can get the new miner for $1823 USD or roughly 7.896 BTC with the current exchange rate. When you add a suitable power supply like the 1600W APW3-12-1600-B2 that Bitmain sells for $155 USD (0.671 BTC) and you factor in the cost of shipping and custom taxes, electricity and the slowly increasing network difficulty you are already looking in probably 8-9 months at least to get back what you have paid for the miner. So although specifications wise the device looks very good it is still slow to ROI in the current not so great for Bitcoin conditions, but then again this is probably the best Bitcoin mining hardware available to end users at the moment. You can already pre-order a BitMain AntMiner S7 from Batch 1 with expected shipping date announced as late September of 21~30 with a possible delay of up to 10 days extra.